Some of our readers recently reported that they are getting advertising emails from a seemingly scam Asian online store, which is to be found at www.gsmarena-n.com. The emails all claim (in rather bad English) that they are our sister site and urge buyers to shop with confidence. Well, this can’t be more far from the truth. There are many people out there, who make a living off persuading you they represent a well-established trademark – such as ours. Since we have a wide global reach and you never know what sort of a scam you might stumble into, we thought we should give you this heads-up. We don’t sell phones, tablets, computers or related equipment and we have no plans on opening a retail or wholesale store for those. The ads that you see on our website come from third-party stores that we don’t necessarily endorse – we merely rent out our banner space to them so they can showcase their products to you, the most dedicated mobile phone audience in the world. But that’s that and we won’t be crossing the line to retail ourselves. So if you ever find a website that claims that it’s selling any products on our behalf, you may be darn sure it’s bogus. In this particular case the imposters present themselves as gsmarena.LTD. We don’t know if that’s a legitimate company in the country where they come from, but you can be sure we don’t have anything to do with a company with that name anywhere in the world, even though it sounds a lot like our own website’s name. 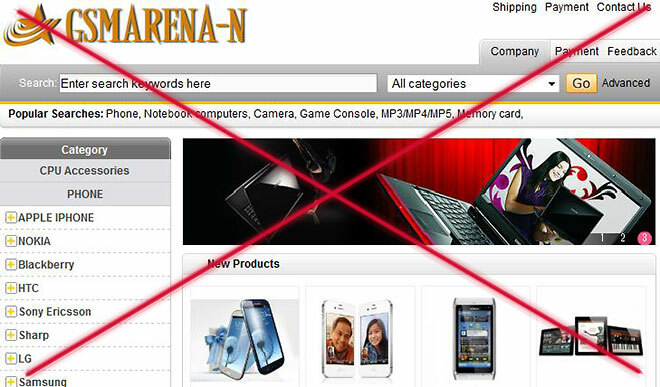 We gsmarena.LTD.We have sister website tell you about mobile phone now you buy hear Our company of various electronic products including: wholesale mobile phone, computer, game, camera, television, USB, Recorder Pen,cpu, Mp4, e-books. Electronic daqo. All of our products are new high quality and low price, the original, ensure unlock, by the international and packaged in a sealed box part. As usual with these things, when in doubt, make good use of your sound judgement and always doubt facts, presented to you in unsolicited emails, and when a price seems too good to be true, it usually is. Stay safe!